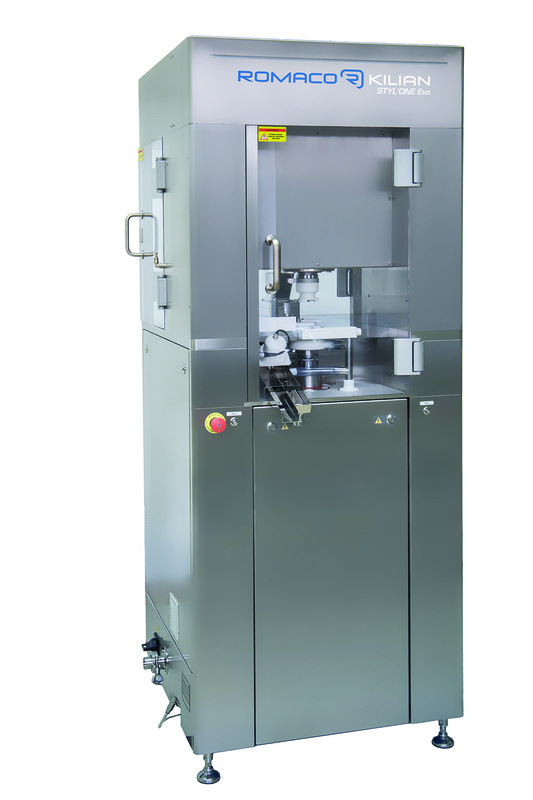 Together with Huhtamaki, the film and foil specialist, Romaco Siebler will premiere a push-through strip packaging for pharmaceuticals. The tablets can be removed simply by pressing them out of the pockets in the four-sided sealed foil pack. This innovative push-through strip thus combines the excellent barrier properties of strip packaging with the opening mechanism of blister formats. In direct comparison with cold formed aluminium blisters, the push-through strip scores with its lower consumption of packaging material. The thinner foil of the heat-sealed strips enables cost savings here. The new push-through strips are manufactured either from a multilayer laminated PET-PE-Al-PE/Surlyn foil or from a transparent barrier foil. The material does not tear and can therefore be regarded as child resistant. Thanks to the targeted perforation of the upper polyester layer, the pack can be opened simply by pressing the tablet out of the laminated foil with the thumb. The push-through strips are also senior friendly and as such a good alternative to tear-open strip packaging or aluminium-aluminium blisters. Huhtamaki has a patent pending for the manufacturing process used for this special foil. Romaco Innojet will be represented at the Biogrund booth with the Ventilus V 5 processing machine. Biogrund is a supplier of innovative premixes and carriers. The two manufacturers work together very closely, especially when it comes to developing hot melt coating formulations for pharmaceutical products. The Ventilus technology is suited for both melt and polymer coatings. The laboratory-scale version of the Romaco Innojet Ventilus V 5 is used for particle sizes from 10 µm to 2 mm. Only one product container is required for the granulation, drying and coating steps. Due to its special design and enhanced processing efficiency, the system allows up to 85% shorter batch times with hot melt coating applications and up to 25% with polymer coatings. The homogeneous flow conditions inside the cylindrical product container enable extremely gentle intermixing of the batch and hence play a crucial role here. The air flow bed technology ensures accurate control of the product movement and equally precise application of the spray liquids. The process air is controlled by the Orbiter booster, an ingenious container bottom consisting of overlapping circular plates. Together with the Rotojet the central bottom spray nozzle, the booster forms an innovative functional unit that meets all the requirements for linear scale-ups. At the Hennig Arzneimittel booth, Romaco Kilian will demonstrate compression tests with the Styl’One Evolution single-stroke press, which was specially designed for research and development activities. The laboratory press will be equipped for this purpose with Analis, the intelligent PAT software; amongst other things, Analis supports the development of new formulations, analyses of process data and also scale-up tests. The compression force that is necessary to produce tablets with the required thickness or breaking strength can be easily determined using this technology. The Styl’One additionally simulates the compression force profiles of all standard high speed presses and carries out fully automatic compression and performance studies. It achieves compression forces of up to 80 kN with a maximum output of 1,750 tablets per hour. Depending on the test set-up, it is capable of compressing mono-layer, multilayer or core tablets. The Roco Pack software can moreover simulate the roller compaction process, resulting in realistic powder compression and remarkably precise test batches. The user friendly R&D press is an invaluable tool for optimising processes or diagnosing errors. The time saving when analysing and evaluating the results is likewise a big advantage.